Mary Purucker is the director of the Clinical and Translational Science Awards (CTSA) Program hubs in the Division of Clinical Innovation (DCI). Purucker oversees the DCI CTSA Program Hubs team, providing oversight and management of 50+ CTSA Program Hub award institutions, each of which include separate but linked UL1 and KL2 awards, and usually an optional TL1 National Research Service Award. Purucker herself manages seven CTSA Program Hub awards in her role as program director, in addition to several large administrative supplement projects, Small Business Innovation Research/Small Business Technology Transfer grants and R13/U13 conference grants. 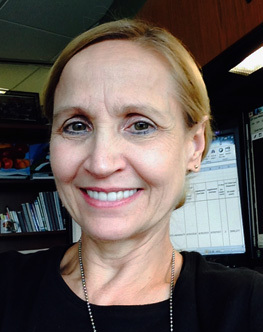 She is closely involved with other CTSA Program and network initiatives, including the NCATS Streamlined, Multisite, Accelerated Resources for Trials Institutional Review Board (SMART IRB) authorization agreement, which will enable all participating study sites to rely on the ethics review of one IRB for each NIH-supported study. Purucker currently serves as the NCATS representative to the national CTSA Program Lifespan Domain Task Force, which promotes collaboration among investigators across the 50+ CTSA Program Hubs to ensure that translational science is integrated across its multiple phases and disciplines within complex populations and across the individual lifespan, in alignment with the Institute of Medicine Report on the CTSA Program and NCATS Advisory Council recommendations. Purucker came to NIH in 2008 after a 12-year career with the Food and Drug Administration that included leadership positions in offices with responsibility for a full spectrum of the agency’s regulatory activities, including premarket product review, post-marketing compliance, pediatric therapeutic development and medical countermeasure initiatives. Purucker is a graduate of the MSTP program of the Albert Einstein College of Medicine, where she received her M.D. and Ph.D. in molecular biology. She is a member of the American Pediatric Society and is board certified in internal medicine, pulmonary diseases and critical care medicine. Purucker’s research interests include animal models of human diseases, inhalational drug product delivery systems, and innovative regulatory strategies to accelerate development and marketing of novel therapeutic products for unmet needs. Sponsors meet scientists to speed pediatric medicines development. The clinical translation gap in child health exercise research: a call for disruptive innovation.